Last Friday, my neighbor who is a nurse at the same hospital where Shira Ish Ran is hospitalized, presented her with your letters. And yesterday, I received several nice birthday presents, but by far the most exciting one was the following expected text message (which plinged while I was filming yesterday’s birthday blessing video). Natanel Ilan ben Shayna Tsipora, (Nathaniel Felber) who made aliya several years ago from Maryland. 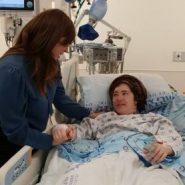 Any updates as to who still needs tehillim said for them?